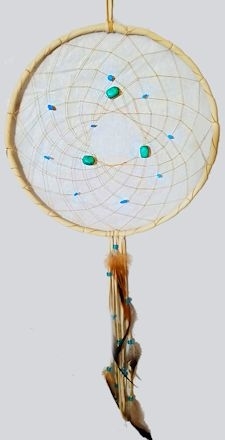 This dreamcatcher is 12" in diameter and the overall length is about 24 inches. This dream catcher is wrapped in genuine deerskin leather and has assorted glass beads or semi-precious stones in the web. Natural feathers are used from turkey, pheasant or coque. There are six long fringes decorated with glass crow beads and six feathers. Shown in beige buckskin with turquoise beads and stones in the web and half bronze coque feathers. Available in an assortment of leather colors. Use the dropdown menu below to make your selection. Made in the USA when you order it, so allow a few days to a week for construction of your handmade dreamcatcher. This product was added to our catalog on 06/29/2018.